We now have a party invitation [pdf, 250kB] that you can print out at home and use to invite guests along ... if you've any comments (good or bad) about this invite please let us know. We suggest that you print the invites on coloured paper or card then chop the page into 3. You could even draw a picture on the back. These invites will fit in a standard letter envelope. Barefoot Ceramics can come out to your location too - we offer mobile pottery parties and take-away packages too. So you can Have Fun! painting your unique pottery pieces at home with friends or at your own pace. Just ask for details. Whether it's a special day, birthday party, Hen Do, anniversary or just an excuse for a get-together we have the perfect party for you ... host your event at our place. 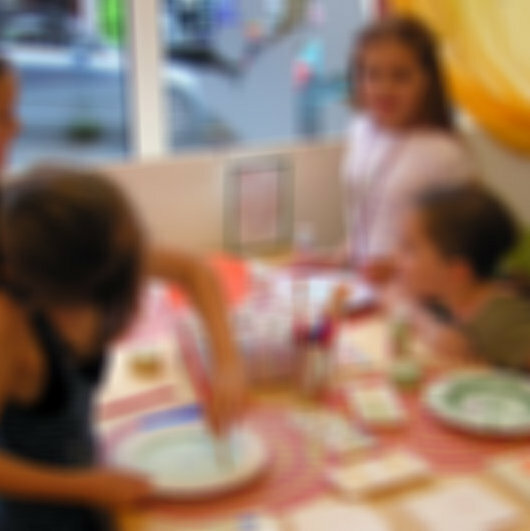 Have a giggle as you get creative; a pottery party painting your own ceramics makes the perfect icebreaker for new friends and a great talking point for old friends. Even better you all create a lasting keepsake, your very own painted pot, to remember your happy time together. We can come to you, provide a separate area for smaller groups during normal opening hours or you can reserve the whole pottery studio just for your group. 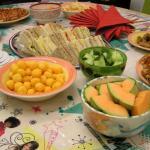 A typical regular party with food lasts an hour-and-a-half give or take ten minutes. You get the studio for 2 hours though so you can hang around and chat and eat cake afterwards (yum!). We normally give you a talk at the start, tailored to the ages of the guests; then choose ceramics to paint. You get started with your designs whilst we give tips and suggestions and help you create your beautiful ceramic masterpiece. Once you've finished painting we take your pottery away to be fired in our kiln. Then whilst we clear up the mess you enjoy your food, drinks and cake! Glazed finished pots are ready to collect in 4-7 days. You can download our general party information [PDF, ~0.5MB] (or view in online viewer) which is geared towards children's parties. Or, do please contact us with any further enquiry. If you're not looking to have a party or just want to pop along with a couple of friends then you can come in to the studio within our normal studio hours - booking strongly recommended (as we sometimes are closed in regular studio hours). With a group you can book outside of normal hours too; a great way to relax and get creative.